Last year, Thefty was commissioned to design a range of greeting cards for Roger la Borde, the wonderful London-based publisher and producer of luxurious, eclectic stationery products. It was such fun working with them! The Thefty card collection includes five typographical designs, with lettering drawn by hand and digitally rendered and coloured. The cards look fantastic in print – Roger la Borde printed them on uncoated, antique wove board, with glossy raised sections produced by specialty thermographic printing. You can see the range on the Roger la Borde Website, and you can now buy the cards from our online stores, either on Etsy or Folksy. Hello! I’ve been so busy working on a big personal project (details coming SO SOON!) that I have had fewer commissioned pieces to share with you. Having said that, I’ve still been taking on projects here and there, and this is one of them. You see, my friends B & C have a private in-joke involving elephants and teacups (and elephants in teacups) and when C asked if I could illustrate it for B’s birthday, I was all in. The joke frankly makes zero sense but I’m all about drawing vintage crockery and sweet-faced animals. The piece is felt-tip pen and white pencil on textured grey paper. I love Photoshop, but I also love busting out my pencils and sharpener and getting to choose beautiful paper to put in a frame. I hope you like it, B! A Commission: Maths, Science and Art. Hello! It’s nice to be back! I have lots to show you over the coming months, and this is a nice place to start. As you know, I studied biology at university, and the crossover between science and art is an endless source of fascination and fangirliness for me. I was therefore very excited about working on this private commission. This piece was created for a gentleman (let’s call him Mr. X) who has worked in academia for many years, researching in the field of mathematical population genetics. For those of you who are scrunching up their faces right now, it’s about using maths to analyse the genes present in populations and how they evolve over time. Basically, it’s super complex but also super cool. You might recognise some of the geographical landmarks in the painting – they depict special places in Mr X’s life. Coincidentally, some of them are special places for me as well, so it was particularly fun to draw them. Happy birthday Mr X! I hope you agree that your life looks beautiful as a painting (and beyond). Psssst! I know I’ve been very quiet but I promise I haven’t disappeared! I’m planning some (fairly) big changes around here and am working furiously on a brand new personal project which I’m really excited about…I just can’t show you what I’m working on quite yet. Thanks to all of you for sticking around. I look forward to having fresh new work to show you soon! Oh, oh Frida: Seven faces of the colourful Ms Kahlo. Last weekend, I was having a chat with my boyfriend when I happened to mention Frida Kahlo. He had no idea who she was. Somehow, he had managed to go almost 30 years without seeing any picture of the iconic woman or her artwork, and I felt the need to rectify that. I dragged him to my computer and Google Image searched her name, talking all the while about her life and her struggles, her colours and flowers, and of course those magnificent, defiant eyebrows. Consequently, I’ve been thinking about Frida all week, and when I picked up my sketchbook last night it was to draw her face. Or, rather, to draw a face…Fridafied. I started with a pen drawing but I ultimately ended up on Photoshop, where I completely let loose. I layered colours over colours and textures over textures. Pattern, blur, filter, smudge. Spots, dots, swipes and stripes. I ended up with a whole series of Fridas, which is what I’m showing you today. Drawing – along with copious amounts of Haribo, tissues, cookies and Vitamin C – helped me through my week of fever and sniffling. Drawing is my ultimate distraction from everything happening around me (and I’m guessing that most illustrators would say the same). I also enjoy looking at my sickness sketches once I’m better, because there’s something about the melodrama and self-pity which is kind of hilarious to me! Anyway, I’m pleased to report that I’m better now, and it’s back to regular programming on Instagram! Back in Stock! Good Vibes prints and postcards. Hello! I just restocked my Folksy Store with ‘Be Happy’ and ‘Chin Up!’ postcards and A3 posters. The A3 posters are printed on beautiful, 235gsm satin photo paper with a semi-gloss finish. The postcards come in packs of six and are printed on 100% recycled, 280gsm matte card stock. I made them as an antidote to rainy day gloom, and I recommend tacking them up above your desk for those days when grumpiness sets in! Head over to my store and have a look! Double Thefties: Mirror Images and Pattern Play. Hello! 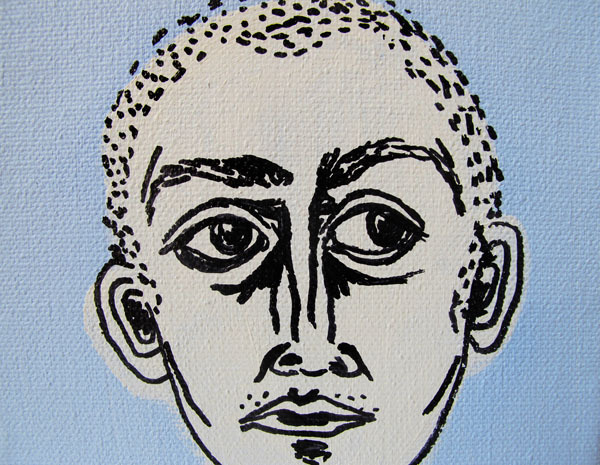 Today I dug up one of my old paintings, a self-portrait that I made many moons ago. You already know how much I adore patterns and portraits, but did you know how much I enjoy reinventing old pieces? Because It’s a lot. In fact, while some people relax in front of the telly, my afternoons off are spent playing around with Photoshop. (My sore back is a testament to how much time I spent hunched in front of my monitor.) Anyway, enough chatter! Here are some fluoro Double-Thefties, disco style! Happy Anniversary: A Comic Strip. Hello! Here is an illustration that I completed last month. It was commissioned as a wedding anniversary gift from a wife to her husband! Sweet! I was asked to illustrate the text messages that she and her husband sent to each other on the eve of their wedding, and on the morning of the big day. I turned the texts into a hand-drawn comic strip! I really loved playing around with the layout and adding dialogue (as well as slightly absurd details such as an owl out the window). If you’re wondering why there are greyed-out bits, blank spaces and empty speech bubbles, it’s because I edited out the names of the bride and groom to give them a bit of privacy! In other news, his is my 3rd marriage-related commission of the summer (Here’s the first and the second)! It’s really kinda nice to be involved with so many people’s happy occasions – these kind of commissions really give me the warm and fuzzies. Hello! This has been a real Summer of Love at Thefty HQ, as this is the 2nd (out of three!) wedding-based commissions I’ve worked on since June! This one was commissioned as a gift for a wedding which took place last month. The brief was to create a Coat of Arms for the bride and groom, incorporating the couple’s story, as well as their favourite things and personal jokes. What a sweet, thoughtful gift, huh? I really enjoyed working on it. Firstly, the groom loves bananas (one of his nicknames is ‘Banania’, I’m told) and the bride is a vegetarian, hence the inclusion of a whole freakin’ grocery store on the coat of arms. (I really love the bananas – they look quite grand yet also very silly.) The bridges represent where the couple is from and where they live – Sydney and London respectively. There are also some owls at the top, which are the couple’s favourite animal (I drew two of them, to represent the Love Birds themselves, hee hee).The ring is quite self-explanatory, but the bike? Well, that’s the Engagement Bike that the bride gave to the groom! Ha! Finally, I also included the wedding date, and the initials of the Bride and groom. Congratulations, guys! May the House of C&I prosper! 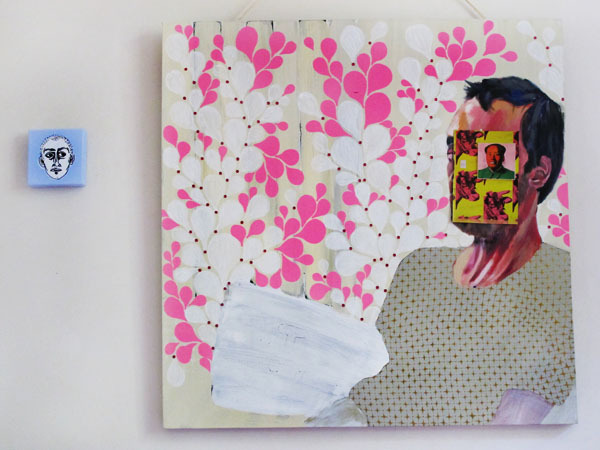 I love how silly the tiny canvas looks next to my massive portrait of my boyfriend. (Yes, that’s Andy Warhol’s Mao hiding my boyfriend’s face. My Dearest One started to get weirded out by seeing himself hanging on the wall all the time, so we’ve covered him up for the time being.) 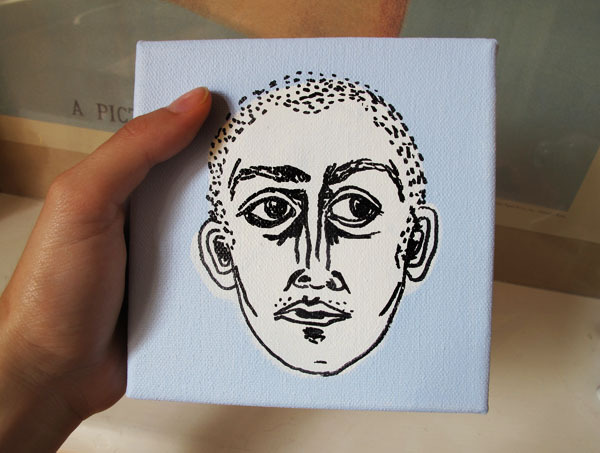 After I finished drawing on my tiny canvas, It struck me that the man I’d drawn looked kinda like my brother. I’m therefore going to call this one ‘Little John‘. The best thing about tiny canvasses is that they’re unintimidating. There isn’t a massive blank space staring at you, daring you to mess it up. It was so easy to slather the hand-sized canvas in paint, and and to pick up my black marker and doodle a face on top. So easy. Sometimes, it’s nice to draw easy things. p.s. if you’re wondering what this post title is all about, listen here. 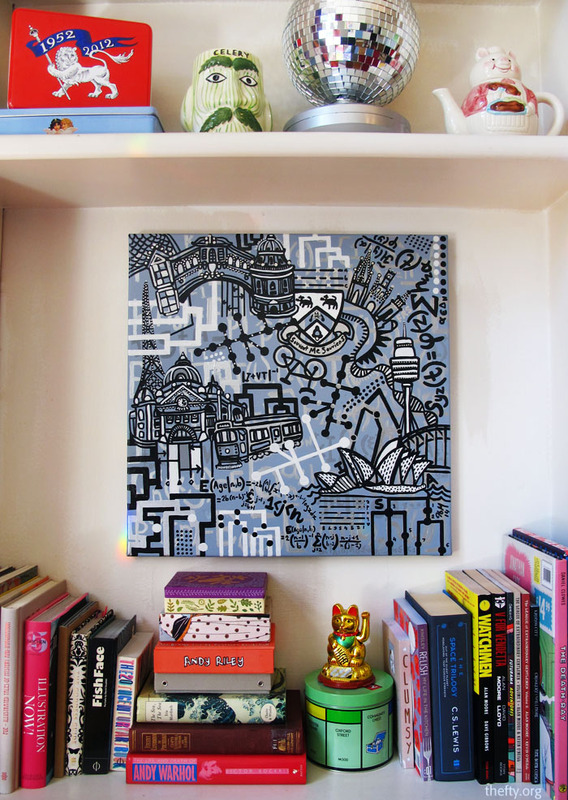 Wedding Illustrations: Cities of lurrrve! OK, so, here’s the truth: Some illustration projects are more fun than others. This one was definitely one of my favourites, and I’ve been dying to show it to you! I created a series of ten framed drawings for the wedding of Tom and Sophie, one for each table at the reception. The couple asked me to draw the cities that they have visited together, including where they got engaged, where they live, and where they where they went to university. They sent me a list of things they did in each city (mainly revolving around drinking, ahem!) so that I could incorporate them into my illustrations. I love projects where I can add lots of tiny details and personal touches, so this was right up my street. No. 2 Living and studying in London, England (hence the fruit flies and microscopes). No. 3 Sophie and Tom went on a train trip around Europe, which involved ‘flat bums and lots of queues’. No. 4 NYC, USA! A holiday involving lots and lots and lots of shopping and sightseeing! No. 5 Oxford, England. Studying, punting, and drinking, drinking, drinking. No. 6 A holiday in Tokyo, with ‘lots of temples and sushi’ No. 7 A trip to Berlin, where Sophie and Tom drank cocktails by the river in Traditional German Beach Chairs. No. 8 Barcelona, Spain. Swimming, beaches and Gaudi! Sophie and Tom wanted to decorate the wedding venue very simply, with floral bouquets and my illustrations giving colour to the room. The colour scheme for the wedding was apple green, orange, and berry pinks – I was so happy that my drawings perfectly matched the floral arrangements on the tables, as you can see below! After the wedding, Tom and Sophie told me that they’re planning to hang the illustrations in their living room, to remind them of their wedding day. What a sweet, lovely idea! I’m so pleased that they were happy with my work. Hi. The sky is grey today and I’m feeling gloomy. I’ve lived in England for almost a decade, and I love London so much, but every June my heart starts to tremble and long for sun-drenched lands. This weather makes me homesick. I need some good, summery vibes! My current solution to this grey-skied homesickness problem is to fill my house with colourful flowers and play Belle & Sebastian as loudly as possible, while making drawing after drawing after drawing. Any other tips would be received gratefully! What should you post on Facebook? A Flowchart. This flowchart is based on a sketch I made with my boyfriend, as a joke gift for a family member with a tendency to overshare (we love you, A!). I figure that we could all do with some help in navigating the perils of social media, so feel free to spread the word! If there’s anyone on Facebook that forces you to shield your eyes on a regular basis, send them a link to this post! Consider it a dose of Facebook-TMI-rehab. You’re welcome.